Courtesy of SUNCOAST HOMES & DREAMS INC. Rarely available CORNER UNIT! Sail away to luxury downtown living with feels-like-home comforts, concierge amenities & expansive SW 9th floor views. This updated 3 bed, 2 bath split floorplan with a Frank Lloyd Wright inspired fireplace, walk-in master closet, laundry room, large storage unit & 2 gated, covered & deeded parking spaces will satiate your needs & wants. The interior crown jewel, however, is the upgraded gourmet Italian kitchen with recessed twilight lighting, Zebra wood & Sileston quartz, integrated Jenn-Air stainless steel appliances & stovetop pot filler faucet, reverse osmosis water filtration, breakfast bar, wet bar, built-in Miele espresso machine 8230; AND gorgeous blue sky views from the kitchen sink. Best exterior features? 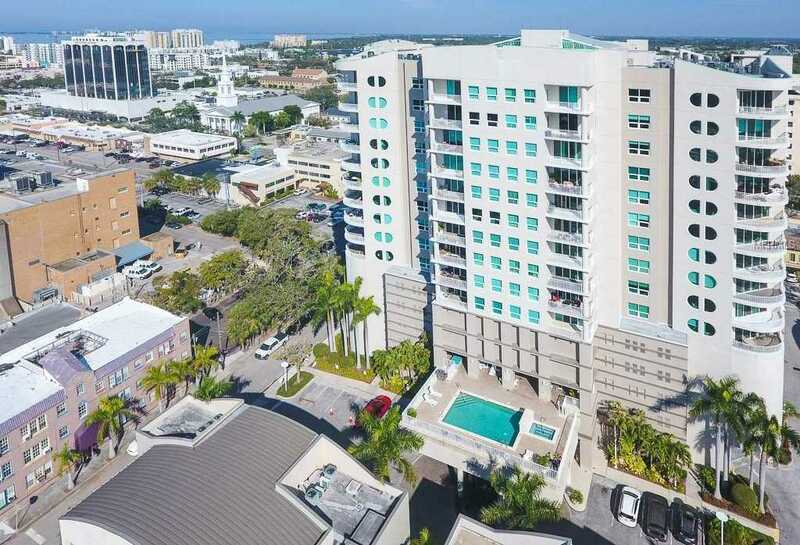 Two private balconies: one tucked away off the guest suite & another centered off the living room with floor-to-ceiling sliding glass doors to welcome the sun, toast breathtaking sunsets & wish upon the stars over Sarasota 8217;s bayfront skyline. Rivo at Ringling is an exceptionally managed & funded building focused on safety & ease of living with concierge front desk service, fitness center, locker rooms, heated spa/pool, sundeck with grill, renovated social/conference room, spots for your kayak & super cool bike storage room. Around the corner from shopping, dining & entertainment options including the movie theater, Payne Park, Bayfront Park & Selby Gardens, get ready to drop your anchor & enjoy the breeze of easy condo living. Restrictions: See pages 14-15 of Rules & Regulations available at www.rivoatringling.com. Please, send me more information on this property: MLS# A4429085 – $750,000 – 1771 Ringling Blvd #910, Sarasota, FL 34236. I would like to schedule a showing appointment for this property: MLS# A4429085 – $750,000 – 1771 Ringling Blvd #910, Sarasota, FL 34236.